Typically I've usually gone with my earliest pollination on the main vine, but the 1685 plant's first female showed up at 8 feet, which is earlier than I would prefer to grow a pumpkin (10+ feet is ideal with the sweet spot between 12-14 feet). The next female on the main vine didn't show up for another 2 1/2 weeks, but since the first pollination was very early and the plant was relatively small, I had some decisions to make. 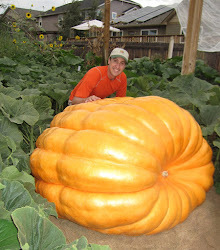 Intuition would tell you that pollinating early is your best bet to growing the biggest pumpkin. There is truth to that, but it isn't fully true. The first 2 1/2 weeks of pumpkin growth and the last 2 1/2 weeks count very little because you are talking 1-7 pounds a day typically at those times of the year. Maybe 7-9% of the pumpkin's overall weight at the end of the season. Every pound counts, but overall it doesn't a make or break the overall weight. Because a pumpkin typically doesn't grow more than 100 days, if you can pollinate a couple of pumpkins early enough and you are still under or close to 100 days from the weight-off then you can make some decisions on which pumpkin to grow. Positioning on the vine and growth rates are the two main things I look at when deciding which pumpkin to grow. When it comes to growth rate, the later pollination will always be a little slower because the first pumpkin will be taking a bigger portion of the plant energy, so you have to put that into your calculations. If you choose to take off the first pollination I'd suggest cutting the stem half way the first day and then the rest of the way the next day so a serge of energy doesn't hit the 2nd pumpkin. Told that can cause problems, but I've never seen it. Pictured here is the pumpkin on the 1685 Scherber that I cut off this morning. It was a slow grower from the start. After cutting it off and weighing it I found that it also went 12% light (a double whammy). I figured I don't have much to lose by taking this pumpkin off and seeing how the other pumpkin performs. Kind of a risk, but there is no risk of this pumpkin becoming a giant, so I'll do comparison measurements between the two pumpkins on the same number of days and see how this decision turns out. The later pollination will be 97 days old by the time I pick it so, it should have a full grow as long as we don't get an early frost (which is a real possibility in Midway). The 747 pumpkin (AKA Jumbo), is growing about 30% faster than the 1685 pumpkin was growing, but still well under what I would like it to be. Nighttime lows right now are very acceptable for growing, but the day time highs have been in the 95-100 degree range, so I just cant win. I mist the plants regularly during the day, but you can only do so much to beat the heat. Jamie, great post as always. I've enjoyed your blog for the past few years and am wishing you a successful growing year! Thanks. This year is a learning year for me. Trying to make the best of it and helpfully next year will be better.